We focus on ensuring a diverse student body by providing community building and engagement, academic support and professional development through several activities to ensure an inclusive environment for students. 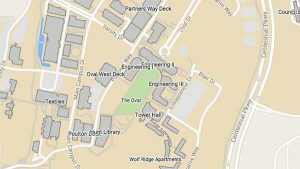 The Minority Engineering Programs (MEP) office in the College of Engineering at NC State is a resource for African American, Native American and Hispanic students who want to become engineers or computer scientists. Our mission is to develop and maintain programs that assist in the recruitment, retention, and graduation of African American, Native American and Hispanic students within the college. NC State is second in the nation among non-HBCUs when it comes to the number of B.S. degrees in engineering awarded to African American students according to Diverse Issues in Higher Education. 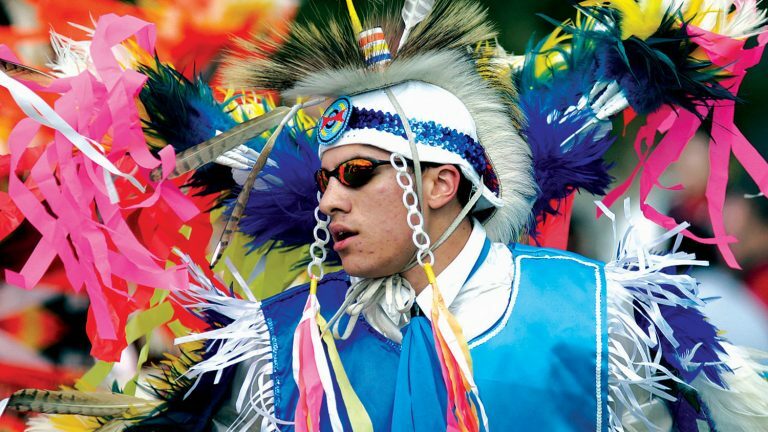 Engineering student dances in the men’s fancy during a Native American powwow at NC State. Students who identify as African American, Hispanic/Latino, or Native American are underrepresented when enrolling and graduating in STEM (Science, Engineering, Technology and Math) fields. As a result, many engineering colleges and universities have minority engineering programs or diversity offices aimed at recruiting, retaining and graduating minority engineers. Many of the same institutions also have women in engineering programs with the same purpose: to recruit, retain and graduate women. Although our programs are open to all students (without regard to race, ethnicity, gender or sexual orientation), students with one of the backgrounds listed above or any combination of the three are automatically a part of the Minority Engineering Programs. * Whether you start your NC State College of Engineering journey as a new freshman or you have transferred to the College of Engineering, you are a part of MEP. *Students who choose not to report their ethnicity will not be included in program communications and activities. Many opportunities will be shared on the MEP ListServ aimed at attracting diverse students to the field of engineering and ensuring retention all the way through graduation from the College. These opportunities may be special events with our corporate sponsors, scholarship opportunities, employment opportunities, etc. Students participate in MEP's Summer Transition Program, a six-week residential program. Select a program tab below for details and related documents. The recruitment weekend is geared towards admitted minority engineering students who are interested in learning more about our campus and the rigors of completing an engineering degree. The Overnight Recruitment Stay will allow students to see first-hand what life as a minority engineering student entails and gain insight into the opportunities available for a successful undergraduate career at NC State University. Event details are sent to all admitted minority engineering students in February. The Summer Transition Program (STP) is a program that enhances the academic and social maturation of incoming minority engineering freshmen prior to the start of the regular academic year. STP is held in partnership with the Summer Start Program. STP is designed to help you learn more about the rigors of completing an engineering or computer science degree while showcasing the support offered via the Minority Engineering Program (MEP). STP offers student success workshops, Professional Communication Workshop, tutorial support for your Summer Start coursework (Math and Chemistry), social activities, corporate field trips and more. There are several benefits for participating in STP: 1) connect with other minority students admitted to the College of Engineering 2) learn about the support components that make up the Minority Engineering Program 3) connect with College of Engineering alumni via our Professional Communication Workshop and 4) network with industry partners via our Friday Industry Visits 5) introduction to campus resources to support your success while at NC State and finally 6) fun with our planned social activities free of charge for participants. The Minority Summer Research Program (MSRP) was piloted in the summer of 2015. MSRP is a six-week program designed to provide high-impact research experiences for undergraduate minority students. MSRP aims to increase each student’s research self-efficacy and awareness of prospective research opportunities in both academic and professional settings. Students complete a week-long Engineering Research Principles course. Students then conduct research and prepare abstracts and posters of their work, which is then presented at the annual MSRP Research Symposium. During the program, students are housed in campus dorms alongside participants in the Summer Transition Program and participate in other STP classes and activities. Applications are mailed to all admitted minority engineering students in April. The program being held is dependent on funding and may not be offered each summer. Student Advancement and Retention Teams (START) is the College’s mentoring program for minority engineering freshmen. An early intervention and peer-mentoring program, START aims to create useful partnerships among minority engineering students. Students are paired by major, demographics, or both, with an upper-class minority engineering student. START mentors act as big brothers and sisters to mentees. START teams meet on a regular basis to discuss a variety of issues, from what classes to take to how to get an internship. Social activities are held to allow START mentors to interact with their mentees in a non-academic setting. These professional student development courses are designed specifically for minority freshmen in the College of Engineering, although they are open to all students. Fall topics for the E 144* course include time management, social adjustment, expectations, leisure alternatives and test management. Spring topics in E 145* include effective communication, resume writing, interviewing skills, internships and co-operative education, and critical thinking. *Information about E 144, E 145 and other courses can be obtained at the Registration and Records’ Class Search. The College of Engineering awards merit-based and need-based scholarships to entering freshmen, transfer and continuing students. The College of Engineering takes seriously its obligation to attract, mentor and graduate a diverse student population. Consequently, every effort is made to ensure underrepresented minorities and women are included in the eligibility pool of serious candidates for merit and need-based scholarships. For more information about College of Engineering scholarships, see scholarships for incoming freshmen, transfer and current students. These three student groups are professional development organizations that allow students to meet other engineering students and become leaders around the NC State campus. Members attend national and regional conferences; receive scholarships through association with the national organizations; network and interact with engineering professionals; obtain information about permanent employment, co-operative education experience and summer internships; and participate in many other activities. The National Association of Multicultural Engineering Program Advocates (NAMEPA), Inc.